The Final Film of Laurel and Hardy starts from, ironically, a losing position, focusing as it does on what is almost universally agreed to be the duo’s worst film. In general, critics have not been kind to the eight feature films made by Stan and Ollie since leaving Hal Roach in 1940, the titles themselves barely seen on television and unavailable for the home market until two DVD box sets plugged the gap. It is only with the release of these sets that a thorough re-evaluation can take place, and the realisation dawn that films like Nothing But Trouble is actually pretty good and contains some marvellous moments. However, there is a big difference between a film such as this, made in 1945, and Atoll K- which did not go into production until 1950, by which Stan Laurel was 60 and Oliver Hardy 58. The problems faced by Atoll K aka Robinson Crusoeland aka Utopia are legendary- concerning as they do three main aspects, the language difficulties of a multi-national cast, the script and not least the illnesses that plagued both Laurel and Hardy throughout filming. Even once the film was finished the problems did not end- the early U.K. reviews were favourable but after that things went rapidly downhill, the film being available in a baffling selection of different editions but- most lamentably of all in the age of the remastered film on DVD- in poor quality, worse even than the late 1920s films! In The Final Film of Laurel and Hardy Norbert Aping charts the conception then filming of Atoll K before delving into the niceties of the releases of the film itself. The book is split into two main parts- ‘The Production of Atoll K’ (8 chapters) and ‘Atoll K On The Market’ (which logically surveys the differing language versions of the film across its 6 chapters). These sections are followed by five useful and detailed appendices covering such aspects as the releasing of, and scenes cut from, the various versions of Atoll K.
One of the main strengths of Aping’s book is his meticulous research both in terms of ascertaining precise information about the film’s varying releases but also in his commendable use of surviving personnel from the production which give his book an added gravitas and authenticity lacking from mere interpretation of what ended up on a wide range of inferior quality DVDs. What is perhaps most fascinating is that even Aping realises early on the immense difficulty of his task, for he is in effect championing (or at the very least calling for a re-assessment of) Atoll K, a film he refers to as ‘an artistic catastrophe’ (p.6) but one which, he still feels, ‘does benefit from a string of new, unknown Laurel and Hardy gags’ (ibid.). In short, the sheer comprehensiveness of Aping’s book makes it by far the definitive work on Atoll K (of which barely anything critical previously existed) but also a tangibly persuasive argument to re-evaluate what is often quickly dismissed as easily the duo’s worst film. Despite Aping’s assertion, Atoll K (at least, in its truncated 82 minute version) is not a good film. However, like Laurel and Hardy’s 1940s films, it does contain wonderful moments that show the duo still retained their comic timing and professionalism. One of these occurs immediately after the opening credits in the lawyer’s office and is ‘a worthy start for a Laurel and Hardy film’ (p.56). It is no coincidence that the pair dominate it. Later, there are charming moments with Oscar the lobster, but the genuinely funny, innovative gags that dominated the duo’s golden period in the 1930s are gone- largely replaced by re-workings of moments from their other films. It is additionally difficult to whip up enthusiasm for Atoll K because of the physical state of both men- Hardy looks overweight and noticeably struggling with the more active moments, Laurel appearing gaunt. Given that both were ill for periods of shooting it is perhaps one major achievement that Atoll K was completed at all, though the generally perceived wisdom is that it represents a sad swan song for the comedians who often look lost amongst a cast devoid of their familiar foils and acquaintances. Whatever the merits of the film under discussion, one definite plus of The Final Film of Laurel and Hardy is its frequent illustrations, the superb array of production stills and behind-the-scenes photographs courtesy of Suzy Delair (eg.- pages 96 and 101) or script girl Sylvette Baudrot (eg.- pages 84 and 102) bring the whole ethos of the film alive. Later, Aping provides publicity images of movie posters for Atoll K, although these would have benefited enormously from being in a colour plate section as, unlike the photographs, they look a little too sad in monochrome. Another major advantage of the book is its comprehensiveness- it will be the standard reference book on the film and I cannot ever see it being surpassed for its sheer depth and research. If anything, the book is almost too detailed, for most readers (including myself) do not have the luxury of viewing even the longest surviving version (98 minutes) of Atoll K, but have to make do with the 82 minute Utopia. In addition, unlike say a film like Way Out West which is memorable enough to revisit, Atoll K is not a good enough film to bear repeated viewing, which the amount of detail in Aping’s book almost demands. Given all the problems that beset its production, it would be a little churlish to dismiss Atoll K as ‘sub par’ before swiftly moving on. Given his closeness to the film throughout his research, Norbert Aping’s assertion that ‘Laurel and Hardy…had no need to be ashamed of their final film together’ (p.231) is an understandably warm reaction to which one really has to agree. Although its two stars suffered throughout the shooting and perhaps ultimately regretted their involvement, the only moments of Atoll K that are really of merit are those with their presence. Thirty years after their first film together, Atoll K closes the book on the greatest comedy team in film history. It is not a memorable finale but invariably better than nothing- in the words of Norbert Aping: ‘against all odds, and just as they did in over a hundred misadventures, Laurel and Hardy persevered’ (ibid.). With The Final Film of Laurel and Hardy, Norbert Aping has almost invented a new genre of academic study, such is the level of detail and commitment evident within its pages. The fascinating thing is that there are many books about ‘obvious’ films (consider any of the thin guides focused on landmark films of both Hollywood and world cinemas), but a film such as Atoll K is about as far from these as it is possible to get. The whole process is not one of radical re-assessment- and suddenly realising that perhaps the film might be a great one after all- but rather one of understanding. It is this understanding which Aping seeks to cultivate, moving attention away from mere uneducated criticism to some sort of empathetic reaction- Atoll K is, after all, available to most of us in battered print reduced by 18% from its original length. If Aping’s book can lead to a fully restored version of Laurel and Hardy’s last film it will be a fitting reward for what is a significant and fascinatingly detailed piece of work. 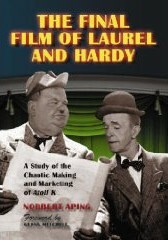 'The Final Film of Laurel and Hardy- A Study of the Chaotic Making and Marketing of Atoll K' is published by MacFarland & Company.